Just Out Today-How Is The U.S. Economy Doing? One of the most important indicators of how the U.S. economy is doing is personal income because it shows the potential spending power of the consumer which drives 2/3 of the economy with manufacturing now driving only 1/3 of the economy. 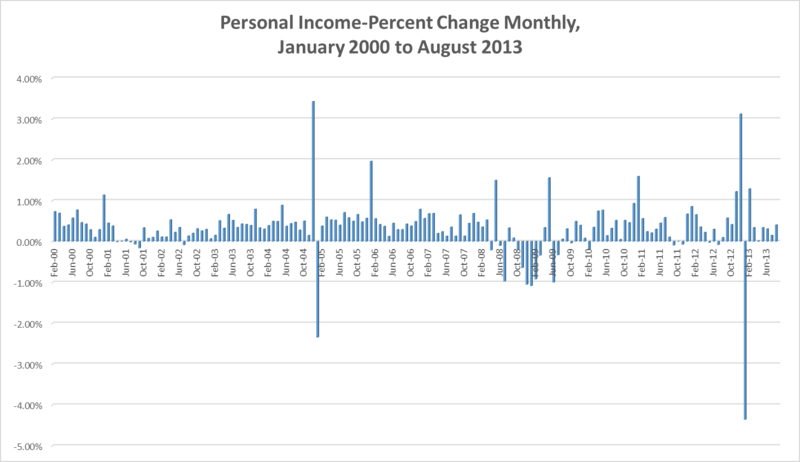 Today the Bureau of Economic Analysis released data on how personal income changed for the most recent period, July 2013 to August 2013. Personal income increased $57.2 billion, or 0.4 percent, and disposable personal income (DPI) increased $56.2 billion, or 0.5 percent, in August, according to the Bureau of Economic Analysis. In July, personal income increased $21.2 billion, or 0.2 percent, DPI increased $32.7 billion, or 0.3 percent, based on revised estimates. Of the 169 monthly periods since 2000, Personal Income growth has been 0.4 percent or more only 42% of the time, and has averaged 0.33%, making this month’s change better than average. 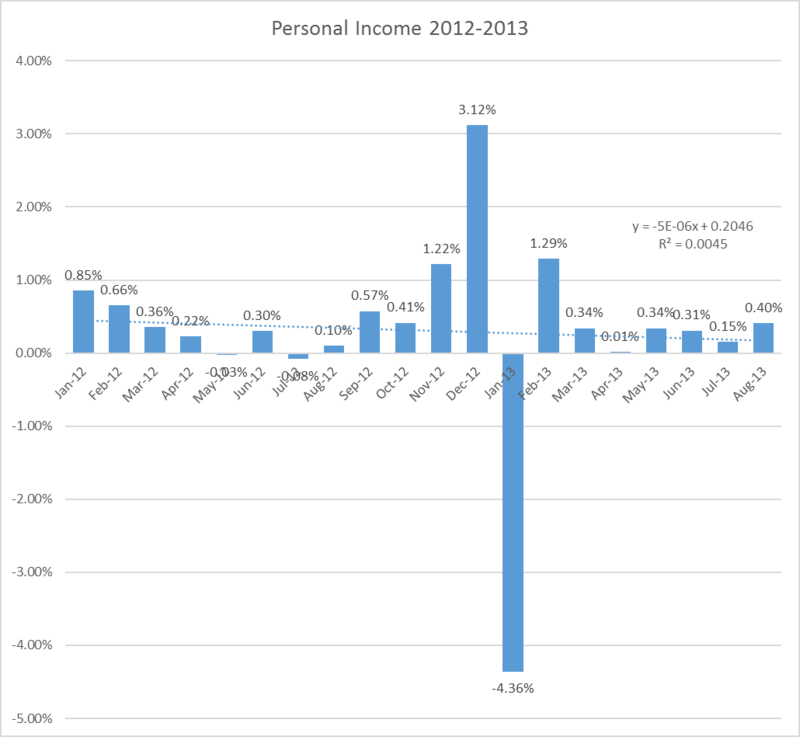 What Does Personal Income Data Tells Us? A look at the more recent personal income change since 2012 shows severe ups and downs at the end of the year, with a declining trendline average around 0.20%. Since February 2013, the average monthly change is 0.41%, making this latest month of August change of 0.40% about average. The conclusion is that the personal income is not getting better since the trendline is declining and the latest month is only average. Personal Income is defined as Income received by persons from all sources. It includes income received from participation in production as well as from government and business transfer payments. It is the sum of compensation of employees (received), supplements to wages and salaries, proprietors’ income with inventory valuation adjustment (IVA) and capital consumption adjustment, rental income of persons with capital consumption adjustment, personal income receipts on assets, and personal current transfer receipts, less contributions for government social insurance. Disposable Personal Income is defined as total after-tax income received by persons; it is the income available to persons for spending or saving. Personal consumption expenditures (PCE) are the goods and services purchased by persons. Last Thursday, data on Real Gross Domestic Product, GDP, was released. This was the third GDP estimate and was based on more complete data than was available for the second estimate last month. Real gross domestic product — the output of goods and services produced by labor and property located in the United States — increased at an annual rate of 2.5 percent in the second quarter of 2013 (that is, from the first quarter to the second quarter), according to the “third” estimate released by the Bureau of Economic Analysis, compared to the first quarter, when real GDP increased 1.1 percent. 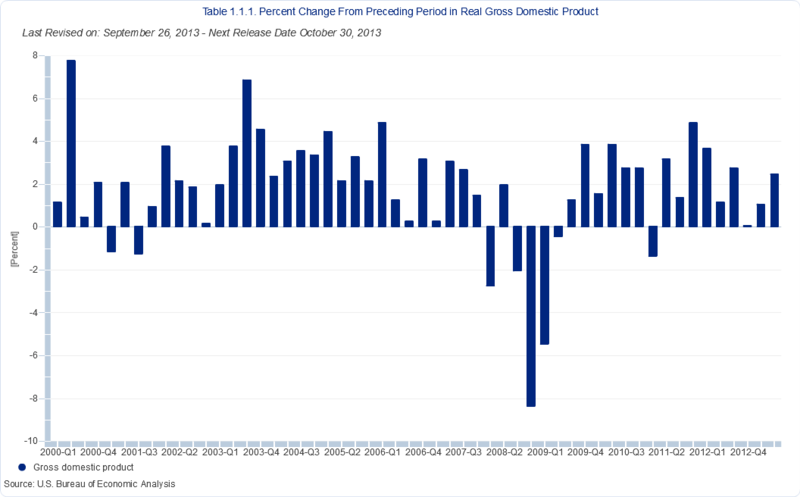 The next release for GDP is October 30, 2013, which will be the advance estimate for the 3rd quarter 2013 period. For more info on GDP including the formula and the New Orleans economy, see our article at http://www.louisianacommercialrealty.com/2013/09/how-is-the-new-orleans-economy-doing/ .